Located in Mendocino County along highway 128, and cutting laterally through the coastal range rather than lying between ridges, the west or “deep end” of the Anderson Valley is only a few miles from the cold Pacific Ocean, while the town of Boonville is some 20 miles to the east. Such unique geography results in a wide diurnal range, with daily high and low temperatures occasionally diverging 40 or 50 degrees. This enables grape growers to keep acid development in line with sugar and flavor formation through long, warm Indian summers. On eastern and ridge-top sites there is plenty of warmth to ripen white grape varieties. Our Chardonnay, from Eagle Hearth vineyard, our Rose, our Cuvee Blanc and our Pinot Noir grapes, from Filigreen Farm, all hail from this appellation. 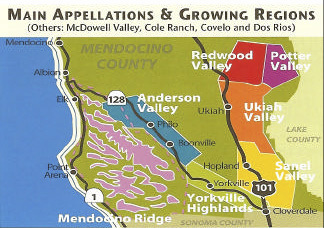 The region boasts distinctive soils and temperatures relative to neighboring Anderson Valley. Yorkville Highlands' rocky soils, with high-gravel content, differ from the loamy, clay soils common to neighboring appellations. These highly-porous soils allow for superior water drainage, forcing the roots of vines to dig deep for water. The result is low-vigor vines that yield concentrated fruit. The moderate temperatures are suitable for Sauvignon Blanc, syrah and zinfandel grapes. Our Sauvignon Blanc wine, sourced solely from the Slippery Slope vineyard, exhibits the complexity and intensity of grapes from this appellation. We also source Syrah and Zinfandel grapes from this interesting area. The Mendocino Ridge is the only non-contiguous AVA in America. Only elevations of 1200 feet or higher are included. Everything lower than that falls into Mendocino County or Anderson Valley appellations. Adjacent to the Pacific, the lower areas of coastal Mendocino County are regularly blanketed with a cooling fog, except for the ridges. These non-contiguous peaks rise from clouds of fog, seemingly like islands, bringing uninterrupted sunshine to the scattering of tiny vineyards nestled among Redwood and Douglas fir trees. The region covers more than a quarter-million acres of mountainous land, but just 75 acres of the entire viticultural area are planted, with Zinfandel being the local specialty since the late 1800s when many of these ridge-top vineyards were first planted. The legacy of the early Italian mountain vignerons is honored today. Our Papillon de Nuit Syrah comes from the Mariah vineyard which is located at 2600 feet elevation, just above the town of Point Arena in this unusual appellation.